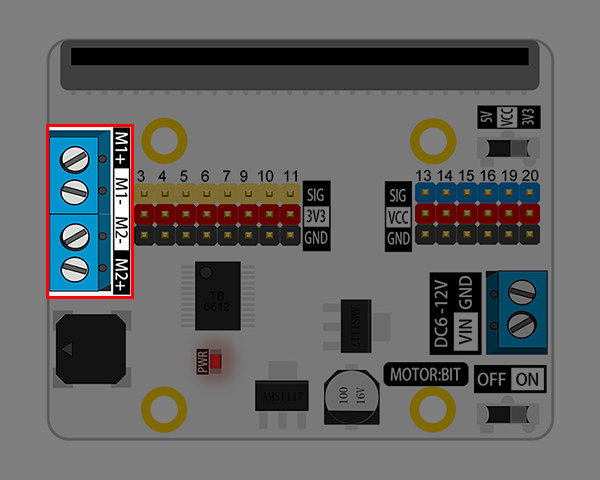 Motor:bit is a motor driving board based for the micro:bit. 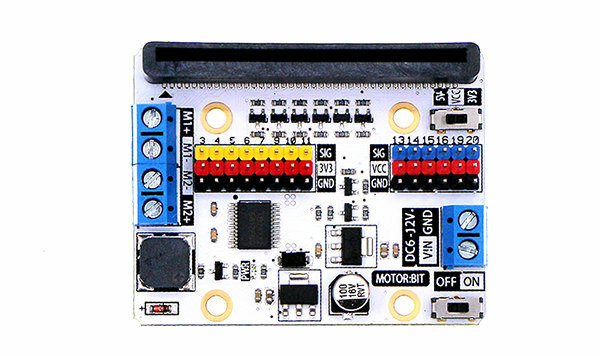 It has an integrated TB6612 motor driving chip, which is used to drive two motors with a maximum of 1.2Amps. It also has 12 integrated GVS ports(for connecting OCTOPUS series of electric bricks) and 1 IIC communication port. These ports allow you to extend with various sensors and electric modules. 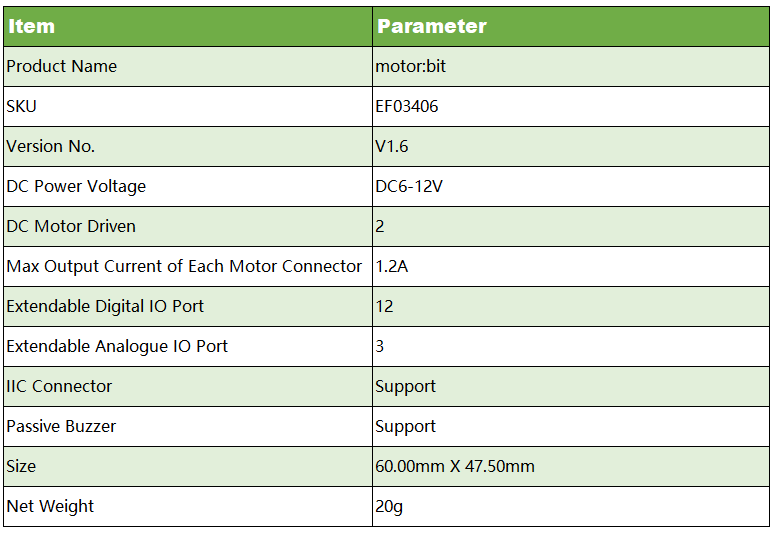 On the board, P3-P7, P9-P10 are IO ports for directly driving 3.3V devices; P13-P16, P19-P20(IIC port) support 3.3V/5V voltage switch. 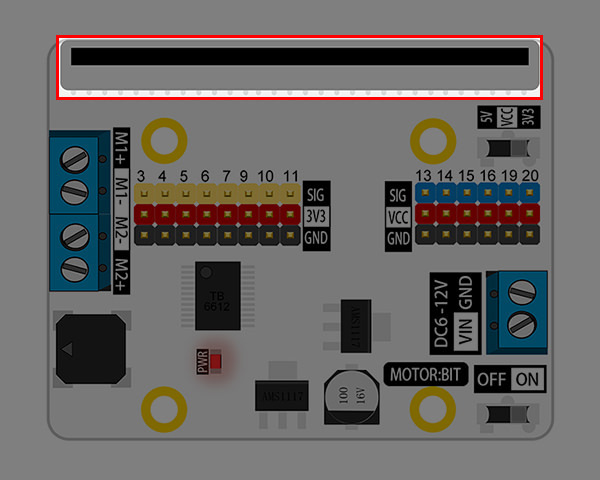 Sliding the voltage switch onboard, it is available to drive 3.3V or 5V devices. Besides, you can play music with the buzzer on motor:bit. 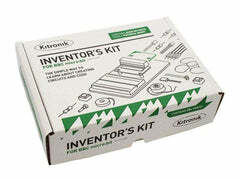 Motor:bit is totally designed for DIYers. You can use it to create your own smart car or more funny projects. Max driving current of a single channel is 1.2A. Extend 14-channel IO ports and lead out it by GVS pins. 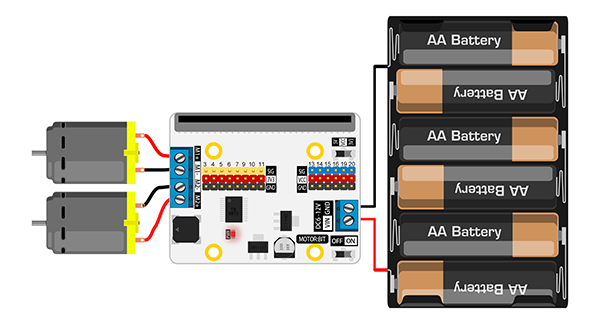 Among it, 6 ports support 3V/5V voltage switch. With 1 passive buzzer on board. 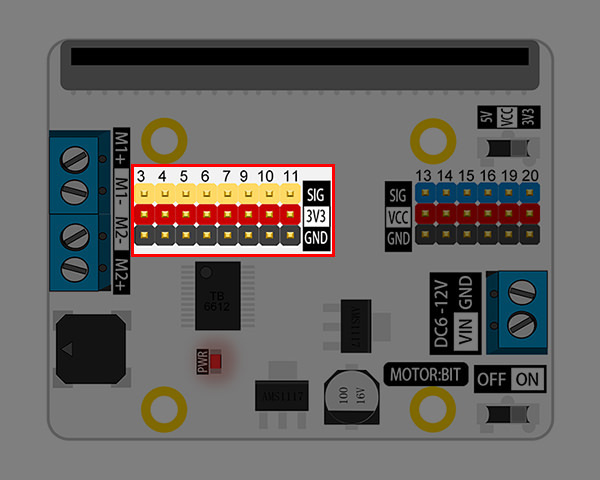 M1 and M2 can separately connect a DC motor with max current of 1.2A. 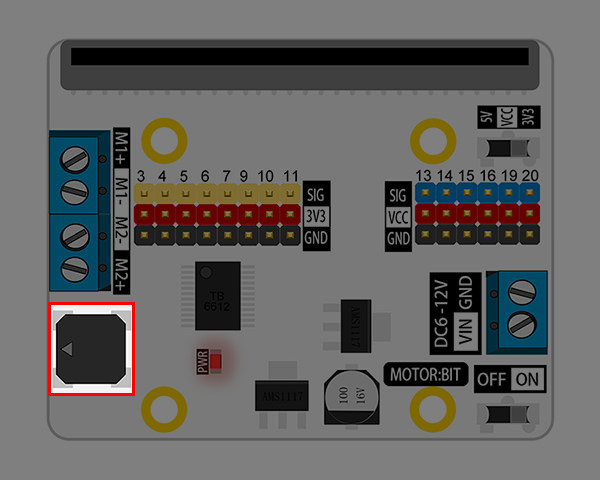 Once a passive buzzer is connected to the P0 port on micro:bit, it can play music. 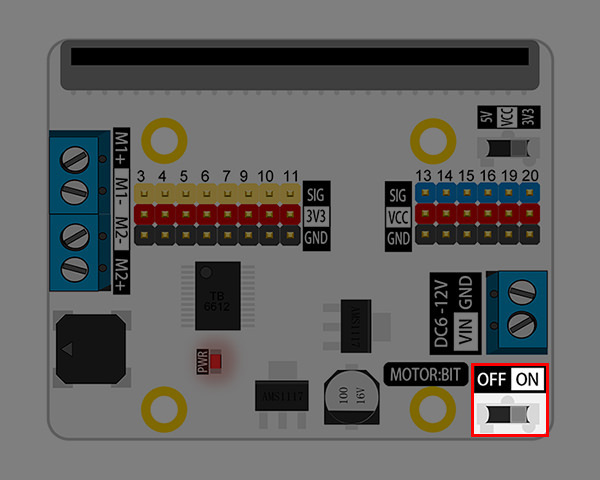 Slide the switch to ON, power is connected; slide the switch to OFF, power is disconnected. 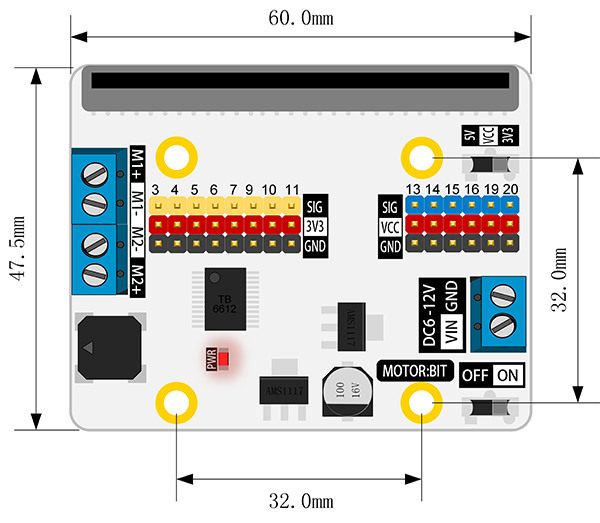 The power connector is available to connect with 6-12V DC power. 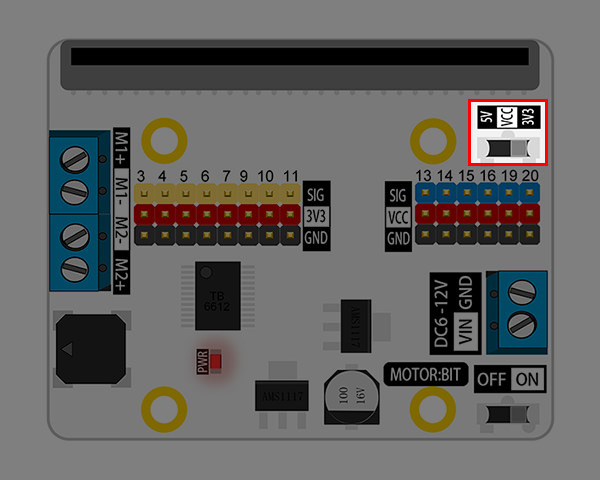 Slide the switch to 5V, then VCC supply 5V power; slide the switch to 3.3V, then it provides 3.3V power. This switch is valid to 6 IO ports only: P13 / P14 / P15 / P16 / P19 / P20. 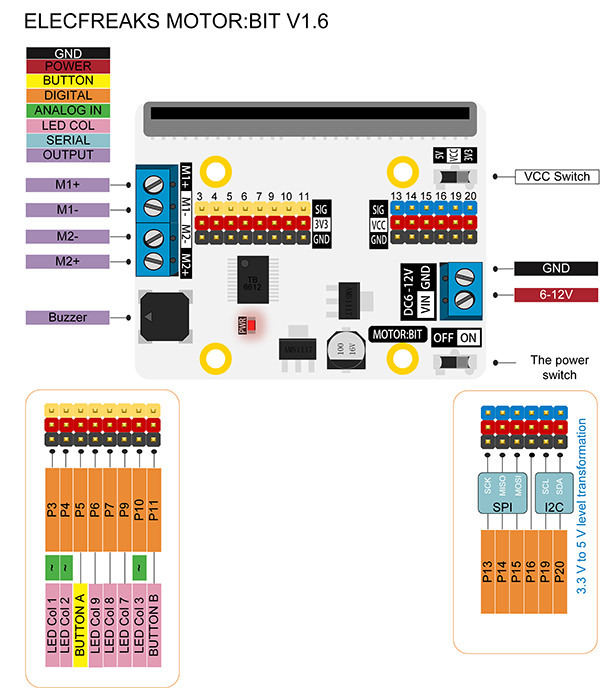 It contains 4 (P13-P16) GPIO ports and 1 IIC communication connector (P19-P20). 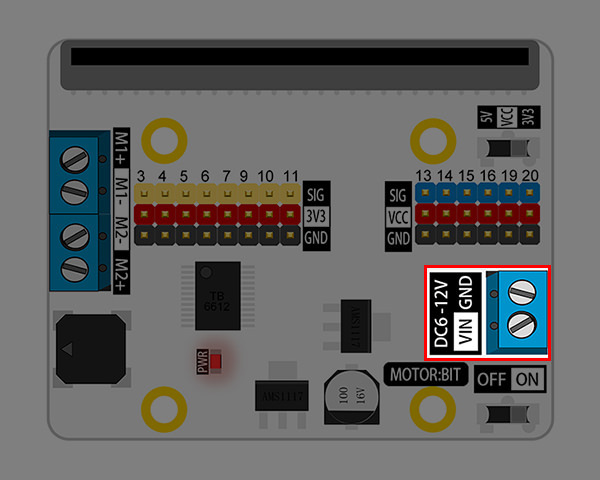 You can connect 3.3V/5V devices to it according to the voltage change of VCC. 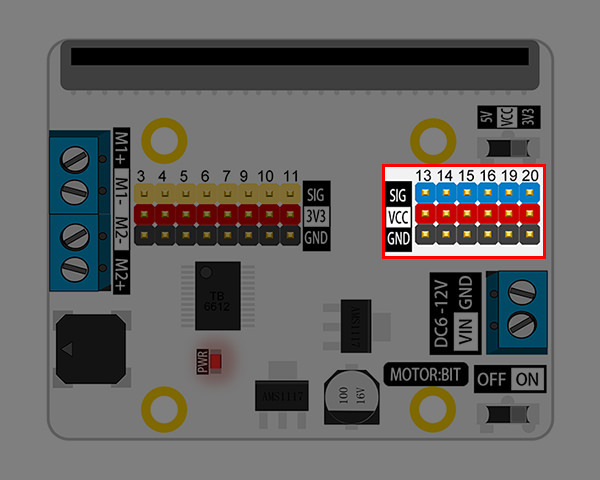 You can connect 8 devices working under 3.3V power supply. Among it, P3, P4, P10 can be used as analogue signal input connectors. 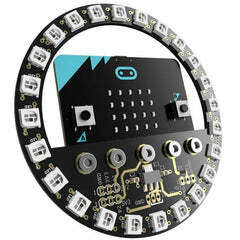 You can plug your micro:bit into this socket. 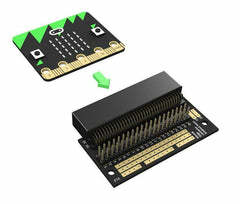 Connect two DC motors to the micro:bit as the picture shows below. 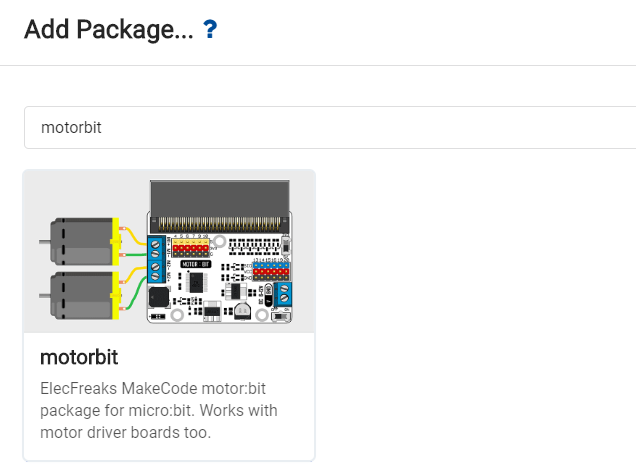 Click Add Package in the code drawer of makecode, then search for the keyword motorbit in the dialogue box and click on the searching result to download this package. Write your code to make two TT motors rotate in turns.